Our range of Toilet Frames can be put in place around a toilet, providing a secure hand hold to push up when getting off or on to the toilet. For maximum safety, the frame can be fixed to the floor, otherwise they are freestanding. 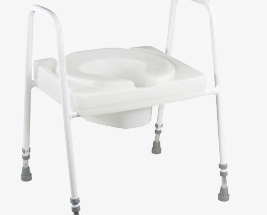 If you require a Toilet Frame and a Raised Toilet Seat, we offer a selection of frames with a built in seat that can be adjusted to meet the user's measurements. When selecting a Toilet Frame, it is important to consider the space surrounding the toilet to help you select the right size of frame.